March Speaker: Pamela Mautte, Director, Alliance for Prevention & Wellness, A BHcare Program. 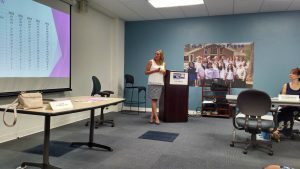 Pamela Mautte, Director of BHcare, provided a presentation on the Alliance for Prevention & Wellness, A program of Bhcare, in collaboration with the Naugatuck Valley Health District/Medical Reserve Corps, Griffin Hospital, Valley Parish Nurses, Police and EMS. The presentation focused on Substance Use Disorder, the overall goals and indicators, objectives/strategies and actions were highlighted. The priority area aligns with Connecticut (SHIP).